Turning 24 years old this month, CTC Travel is a highly established travel agency that provides tour packages to many countries such as Australia, New Zealand, China, America and Europe. However, even for a company with such a stronghold in the tourism industry, CTC Travel has its own problems: they are unable to reach out to the millennials as customers. The problem is simple to understand. The allure of travel agencies ten, maybe twenty years ago, has fizzled out with the advent of the Internet and the information it brings. Previously, to go to any country for the first time, you’d probably opt for a package as you had no idea where to go or what to do. These days, however, everything is a click away. From researching hot tourist spots to booking hotels and flights, you can now plan an entire trip on your laptop. And for youths, that was the way to go. CTC’s current audience is also a factor to consider. The slightly older audience is more comfortable with the fixed package as it contains less hassle, but doesn’t offer the free and easy aspect that many from the younger generation (from 25-35 years old) enjoy. As information becomes more accessible, the younger audience has more options to explore and, hence, more reason to take the free and easy route. 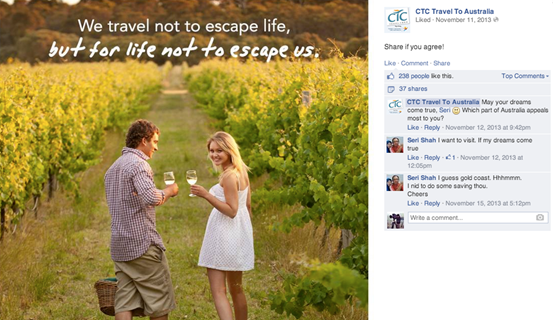 This has resulted in a decline in the number of younger people signing up for CTC travel packages. 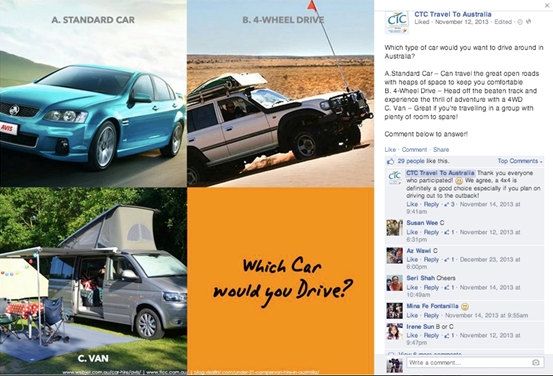 In order to tackle this issue, CTC Travel set up a “Self-Drive” Australia package that provided minimal restrictions. This appealed to a lot of younger people because in essence, the “Self –Drive” tour package promotes the free-and-easy concept, giving tourists the freedom and encouragement to just go and explore the sights and sounds. While the package comes with a hotel and a car for hire, the daily plan is completely up to tourists. This simple plan, which integrated freedom with convenience, was a winning combination for their target audiences. Brew Interactive was brought on to build awareness of the “Self-Drive” Australia tour and to bring in travelers. 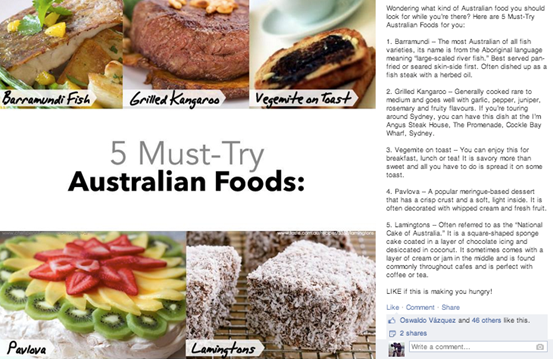 The content produced was targeted at specific interest groups, such as those who wanted to travel to Australia, as well as fans of things associated with Australia (the Outback, vineyards, surfing, driving, etc). The content, added with proper Facebook Ads Targeting, went viral due to its deep connection with the target audience. The campaign saw largely successful results, with 60 people signing up for the package, amounting to around $200k in revenue. That was a total ROI of 1,011%.